Drum corps fans throughout the country got a peek at the 1986 Garfield Cadets in a standstill performance during televised coverage of the Statue of Liberty rededication at the 4th of July weekend, following a lengthy restoration of the iconic structure. Fans couldn't help but notice the corps' 84 brass players at a time when corps size was still restricted to 128, made possible by restricting the guard that year to just 12 members. At the 1986 DCI World Championships in Madison, Wis., Blue Devils became only the second corps to sweep all captions at the Finals, the first being BD's corps from their first DCI title year in 1976, which was the first time the corps played "Channel One Suite." 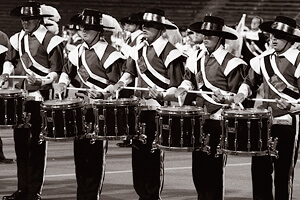 The 1986 championship was the third one earned by the corps while playing the classic Buddy Rich piece. Santa Clara Vanguard's super-fast pants change in the middle of their production was the talk of the season. Two corps earned their highest placements ever—Suncoast Sound in 5th with a searing rendition of the Kenton Band's "Adventures in Time" and Sky Ryders in 9th with the Wicked Witch of the West riding a bicycle across the field during "The Wizard of Oz." It was also the last time fans saw Troopers in the Top-12 until 2009. For the first time, the Cavaliers popped into the top three—barely—by a tenth of a point over the Garfield Cadets, mainly due to a one-point advantage in Performance Visual. 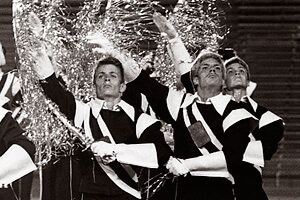 Future DCI Hall of Fame member Steve Brubaker's drill formations were heavy on geometric evolutions, which quickly became the corps' visual trademark over the next several years. Musically, it was the most sophisticated show the corps had done up to that point, pointing the way to several years of contemporary music from both the orchestra and wind band repertoires. The show opened with Peter Mennin's "Canzona," a landmark in contemporary wind literature that was commissioned by Edwin Franko Goldman, composer and founder of the American Bandmasters Association. It was one of the first works to be premiered by the groundbreaking Eastman Wind Ensemble, founded by Frederick Fennell in the early 1950s. This work, as important as it is to the band world, was the only piece for winds the orchestral composer ever wrote. Toward the end of the piece, 16 members of the color guard played crash cymbals, running under a flurry of flags tossed across several yards. The next piece was John Barnes Chance's "Variations on a Korean Folk Song," written by Chance in the mid-1960s and based on "Arirang" (literally meaning "rolling hills" and pronounced AH-dee-dong), a folk song the composer heard while stationed in Korea with the Eighth U.S. Army Band in the late 1950s. It's a song of a woman anguishing over the forced departure of her love. Chance brilliantly took the pentatonic (Oriental five-note scale) melody and added Western harmonies to it, creating one of the best loved and most played works in band literature. Opening with a lovely and extended backfield chorale, void of any marching percussion, the corps progressed through one of the quicker variations and the 3/2 (three half notes of two counts each per bar) ballad before progressing into a short original drum feature by Jim Campbell that some referred to as "Gamelan." The final variation, "Con Islancio" (with impetuousness), is where Brubaker unleashed his most recognizable drill maneuver, referred to as "the dragon," with horns slithering in and out of a giant squiggle. The show's closer was "Mars" from "The Planets" by Gustav Holst. Subtitled, "The Bringer of War," the piece, along with the rest of the orchestral suite, was written during the advent of World War I, although Holst insisted the overpowering devastation of the work was not at all inspired or colored by the rumblings of war in his native England. The suite's concept is astrological, capturing how the planets influence the universe, rather than being astronomically influenced. (Holst had dabbled in the study of astrology.) "Mars" has had a huge influence on popular culture. Composer John Williams liberally quoted from its 5/4 repetitive rhythm in the first two "Star Wars" movies to be produced, and director George Lucas even used the work as a "placeholder" in the first movie until Williams could write his own version. The work transcends the world of symphonic music. Black Sabbath's self-titled song is sampled from the piece and Iron Maiden opened their tour with a recording of it in 2010. The solid red of the final set of color guard flags alluded to Mars being known as the "Red Planet," while other guard members went back to crash cymbals. For the final drill form, the red flags formed a giant circle that intersected the horns and drums, leaving the audience with an impression of the planetary orb that has long been a popular subject of fable and science fiction. For this week only, you can save on the Legacy Collection DVD that contains this complete Cavaliers performance, along with all finalists from the 1986 DCI World Championships. Discount DVD offer ends Monday, June 10 at 8:30 a.m. ET.